HULK VS. COMIC-CON! – FILM CRIT HULK! HULK BLOG! HOW ARE YOU? HULK MISSES YOU ALL DEARLY. YOU MAY HAVE BEEN WONDERING WHERE ALL OF HULK’S COMIC-CON COVERAGE HAS BEEN AND IT’S JUST BEEN TEMPORARILY RELOCATED! HULK TOOK A LITTLE SIDE-GIG COVERING THE FEST FOR ENTERTAINMENT WEEKLY AND HULK JUST WANTED TO SHARE WITH YOU JUST WHAT’S BEEN POSTED SO FAR. 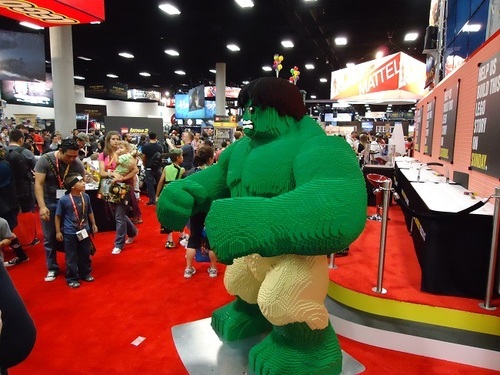 MR. HULK GOES TO COMIC CON – AN INTRO TO THE CONVENTION AND HOW HULK PLANNED TO ATTACK IT! HULK VS. THE COMIC-CON FLOOR – A SPRAWLING, OBSERVATIONAL PIECE ABOUT THE COMIC-CON FLOOR ITSELF AND ALL THE MULTITUDES OF INSIDIOUS WEIRDNESS. THE ANATOMY OF A COMIC-CON PANEL – WHAT MAKES A COMIC-CON PANEL DIFFERENT? THEY’RE CRAZY, CHAOTIC, AND SOMETIMES SUBLIME. AND CZ12 AND THE LEGACY OF JACKIE CHAN – A LITTLE PIECE ON REMEMBERING JUST WHY WE LOVE THE MAN WHO IS THE TRUE HEIR TO BUSTER KEATON. PLUS MORE HUGE PIECES ARE COMING! INCLUDING: HULK’S ALL-DAY ADVENTURE HALL-H, A LITTLE THING ON DR. WHO, SOMETHING ON HULK’S FAVORITE COMIC ARTISTS, A RETROSPECTIVE ON THE ENTIRE CON ITSELF, AND A SUPER-AWESOME IMBEDDED REPORTER THINGY ON RIAN JOHNSON AND THE LOOPER GANG. Previous Post HULK PLAYS WITH THE INDOOR KIDS AGAIN! OCD GAMING MOMENTS! Hope you had fun bro. And banged some of the hotter costumed chicks. HAD MANY FUN, BUT THE WHOLE RANDOMLY “BANGING CHICKS” THING NOT REALLY HOW HULK ROLL. MOSTLY CAUSE HULK LIKES WOMEN AND STUFF. Some really interesting stuff here, and congratulations on the EW gig. I’ve never attended a convention but most coverage on the culture seems to focus on “Top 10 Costumes!” rather than thinking about what people’s behaviour there actually means. I love the enthusiasm and passion there, and would love to go, but there’s something slightly troubling about some of the outfits/way people seem to act your stormtrooper bikini story is a perfect example). Just so you know, it was both a parallel universe AND a Cyberman plot! Also, I can’t comment on Badass anymore it seems (I think I know what comment it was where I crossed a line and yeah, I definitely could have worded that comment a lot better than I did). HULK WAS RIGHT ON BOTH! HULK GENUINELY SORRY BOUT THAT. HULK WISH HULK HAD CONTROL OVER IT, BUT IT’S DEV’S SITE AND HULK ABIDES THROUGH AND THROUGH. Hello, I just left a really long comment on your “anatomy of a comic-con panel” article on EW and I just wanted to make sure you’ll see it cause I did just put a lot of thought in it. So yeah.